Our FB52 crystal clear box measures 5 3/8" x 2" x 7 3/8" and fits A7 envelopes and 5" x 7" cards, holding up to 24 sets. 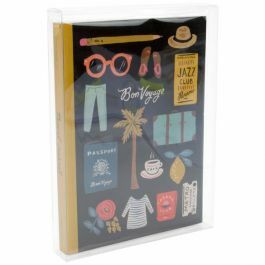 With a 2-inch depth, this box also works great for journals and photo books. Our boxes have pre-folded lines, which we call soft fold technology, allowing for quick and easy assembly. Stickers are included, to purchase additional stickers click here to see our full list of sticker options. The FB52 box is a perfect fit for 24 card sets and provides an attractive display for the retail environment. This soft fold box measures 5 3/8" x 2" x 7 3/8" and fits A7 envelopes and 5" x 7" cards. 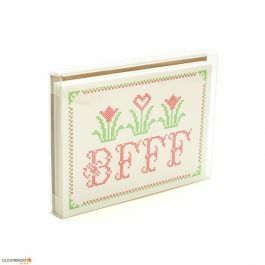 Since this box has a depth of two inches, it is a great option for storing journals or for presenting photos/photo books as gifts. The 12 ml, high density PVC material features incredible clarity making your products stand out. The tabs of the box fold into the sides of the box for a seamless view. Boxes ship and store flat. Outer Dimensions: 5 3/8" x 2" x 7 3/8"
Most popular use is for A7, 5" x 7" card sets (holds 24 cards). Soft fold boxes look great with vinyl and elastic loops. Click here for our line of accessories.